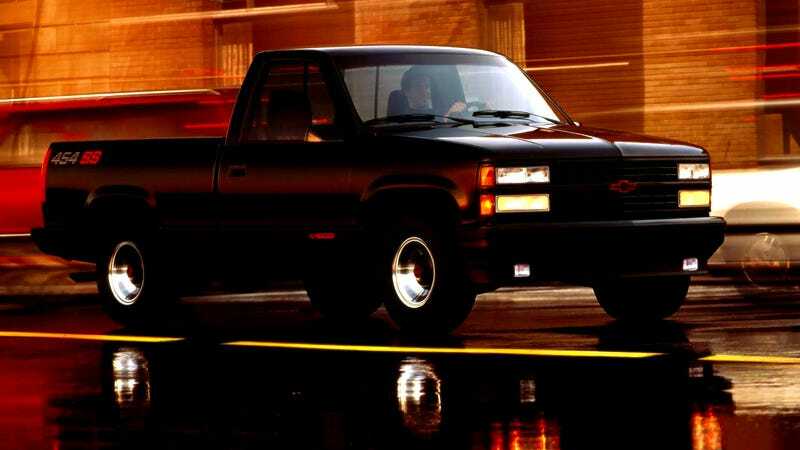 Back in 1990, General Motors stuck a 7.4-liter V8 into a 1500 chassis Chevy pickup and created an icon. The 454 SS was little more than black paint, a red logo on the side and dual exhausts rumbling out the back, but it was great in a way that I can’t imagine being reproduced today. Look at today’s performance trucks. The Raptor, for instance, is covered in graphics and lights. All the speedy Jeeps are a mass of vents. Every Ram is covered in huge labels reading RAM. What I mean to say is the performance trucks and SUVs of today advertise, loudly, their intentions. The 454 SS was less brash. But there is something about them that every time you see one, it stands out. Blocks away in traffic, one rolls by. Duggity-duggity-duggity. The altered front bumper looks low like it’s sniffing at the ground. Prowling a bit. Mean. The actual performance of the truck, sold from 1990 to 1993, is questionable. Though it had a vaunted 454 under the hood, it only made 230 horsepower and 385 lb-ft of torque, as it had for years in the front of bigger, bulkier trucks and Suburbans. The main newness was that it was in the relatively small short bed, half-ton, single cab, 2WD frame, with better gearing, cooling, Bilstein shocks, a front anti-roll bar and quicker steering. The whole package cost you $18,295 and also collected a nice red interior with, at first at least, a tach. But its the subtle meanness of the truck beyond any outright numbers. It’s a spirit that you just wouldn’t see today, a little sticker and little else but a sound of tip off those in the know.